FIG. 777– Nerves of the orbit, and the ciliary ganglion. Side view. The Maxillary Nerve (n. maxillaris; superior maxillary nerve) (Fig. 778), or second division of the trigeminal, is a sensory nerve. It is intermediate, both in position and size, between the ophthalmic and mandibular. It begins at the middle of the semilunar ganglion as a flattened plexiform band, and, passing horizontally forward, it leaves the skull through the foramen rotundum, where it becomes more cylindrical in form, and firmer in texture. It then crosses the pterygopalatine fossa, inclines lateralward on the back of the maxilla, and enters the orbit through the inferior orbital fissure; it traverses the infraorbital groove and canal in the floor of the orbit, and appears upon the face at the infraorbital foramen. 131 At its termination, the nerve lies beneath the Quadratus labii superioris, and divides into a leash of branches which spread out upon the side of the nose, the lower eyelid, and the upper lip, joining with filaments of the facial nerve. Branches.—Its branches may be divided into four groups, according as they are given off in the cranium, in the pterygopalatine fossa, in the infraorbital canal, or on the face. In the Cranium ---------------- Middle meningeal. In the Pterygopalatine Fossa --- Zygomatic, Sphenopalatine, Posterior superior alveolar. In the Infraorbital Canal ----- Anterior superior alveolar, Middle superior alveolar. On the Face ----- Inferior palpebral, External nasal, Superior labial. The zygomaticotemporal branch (ramus zygomaticotemporalis; temporal branch) runs along the lateral wall of the orbit in a groove in the zygomatic bone, receives a branch of communication from the lacrimal, and, passing through a foramen in the zygomatic bone, enters the temporal fossa. It ascends between the bone, and substance of the Temporalis muscle, pierces the temporal fascia about 2.5 cm. above the zygomatic arch, and is distributed to the skin of the side of the forehead, and communicates with the facial nerve and with the aurićulotemporal branch of the mandibular nerve. As it pierces the temporal fascia, it gives off a slender twig, which runs between the two layers of the fascia to the lateral angle of the orbit. FIG. 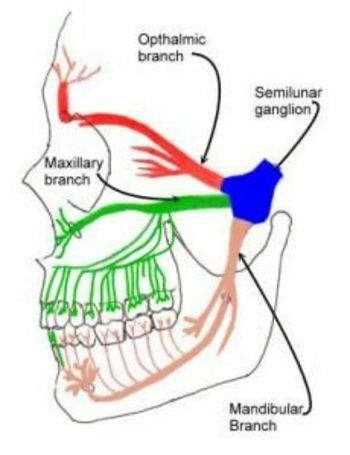 778– Distribution of the maxillary and mandibular nerves, and the submaxillary ganglion. The Anterior Superior Alveolar Branch (ramus alveolaris superior anteriores; anterior superior dental branch), of considerable size, is given off from the nerve just before its exit from the infraorbital foramen; it descends in a canal in the anterior wall of the maxillary sinus, and divides into branches which supply the incisor and canine teeth. It communicates with the middle superior alveolar branch, and gives off a nasal branch, which passes through a minute canal in the lateral wall of the inferior meatus, and supplies the mucous membrane of the anterior part of the inferior meatus and the floor of the nasal cavity, communicating with the nasal branches from the sphenopalatine ganglion. Its sensory root is derived from two sphenopalatine branches of the maxillary nerve; their fibers, for the most part, pass directly into the palatine nerves; a few, however, enter the ganglion, constituting its sensory root. Its motor root is probably derived from the nervus intermedius through the greater superficial petrosal nerve and is supposed to consist in part of sympathetic efferent (preganglionic) fibers from the medulla. 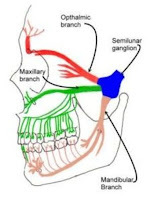 In the sphenopalatine ganglion they form synapses with neurons whose postganglionic axons, vasodilator and secretory fibers, are distributed with the deep branches of the trigeminal to the mucous membrane of the nose, soft palate, tonsils, uvula, roof of the mouth, upper lip and gums, and to the upper part of the pharynx. Its sympathetic root is derived from the carotid plexus through the deep petrosal nerve. These two nerves join to form the nerve of the pterygoid canal before their entrance into the ganglion. FIG. 780– The sphenopalatine ganglion and its branches. The Nervus Spinosus (recurrent or meningeal branch) enters the skull through the foramen spinosum with the middle meningeal artery. It divides into two branches, anterior and posterior, which accompany the main divisions of the artery and supply the dura mater; the posterior branch also supplies the mucous lining of the mastoid cells; the anterior communicates with the meningeal branch of the maxillary nerve. Branches to the external acoustic meatus ----- Parotid, Superficial temporal. FIG. 783– The otic ganglion and its branches. Its branches of distribution are: a filament to the Tensor tympani, and one to the Tensor veli palatini. The former passes backward, lateral to the auditory tube; the latter arises from the ganglion, near the origin of the nerve to the Pterygoideus internus, and is directed forward. The fibers of these nerves are, however, mainly derived from the nerve to the Pterygoideus internus. Note: After it enters the infraorbital canal, the nerve is frequently called the infraorbital.